It's been getting cold and it's been getting rainy, and last week I went to the Caterpillar's Dream and had a very disappointing lasagna, and I wanted to do something exciting with my pasta. I remembered that Cate had issued a challenge: Sweet Spices, Savoury Suppers, and I realised this would be a perfect opportunity to try making a pumpkin sauce and throwing everything in the house into it. boil and mash the pumpkin. puree/mash it with the stock and the soy milk until it's all lovely and smooth. add in the minced garlic. during the pumpkin prep stage, put the pasta on to boil. when it's almost done to your satisfaction, add the broccoli florets and let them boil a little. drain, rinse with cold water, and put it all aside. dice the tofu, marinate in some soy sauce, and then fry until it's all lovely and crispy. put this aside. If you haven't previously checked out Cate's blog, I recommend it - it's not vego but she does lots of great cooking for various dietary requirements, and I have personally had the pleasure of eating all sorts of her delicious creations. On a cycle up to my beloved Mt Lawley for a compulsory visit to Planet Books and Fresh Provs, I spotted a new face on the Beaufort Street landscape: Veggie Mama, next to the adult shop on Vincent Street (where no veggie restaurant had been before). I returned the next day for lunch with my friend V, ready to be delighted. And delighted I was! Clearly labeled (egg free, dairy free, gluten free), there was an array of baked sweets, baked savouries, fresh salads and made to order juices, and I was overwhelmed for choice. 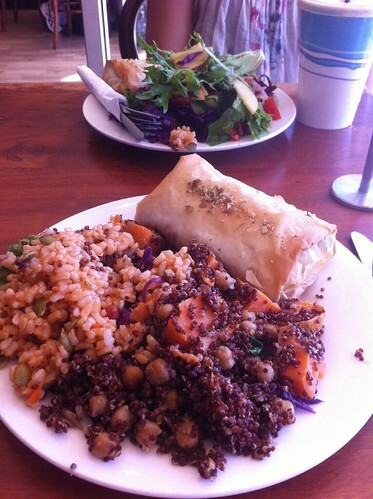 For about $20 I got this filling plate of filo and salads, and a fresh juice of apple, orange and ginger. The quinoa salad in particular was lovely, and the filo, filled with potato, spinach and pine nuts, was delicious and filling. Despite it being a warm and busy Autumn (Easter) public holiday, service was fast, friendly and helpful. And afterwards, I was too full for a muffin, which disappointed me mightily. Well located and with early opening hours, Veggie Mama is almost certainly a place I will return to on a future visit home. Entry to the shop is a wide door, but ordering happens at the counter, which is accessible only by a two-step flight of stairs. Credit card available.